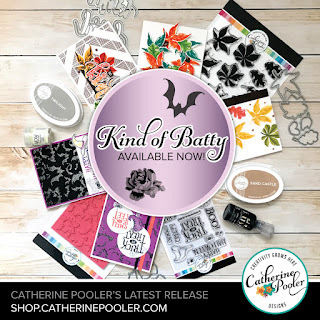 Welcome to release day for Catherine Pooler's Kind of Batty product line! This release incorporates a few different themes: flowers, leaves & Halloween. 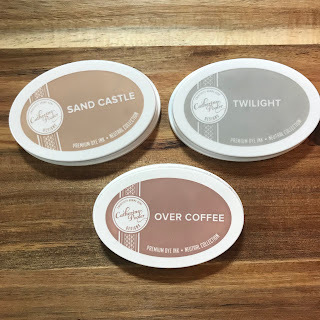 There's something for everyone AND there are THREE new neutral inks releasing: Twilight, Sand Castle & Over Coffee! 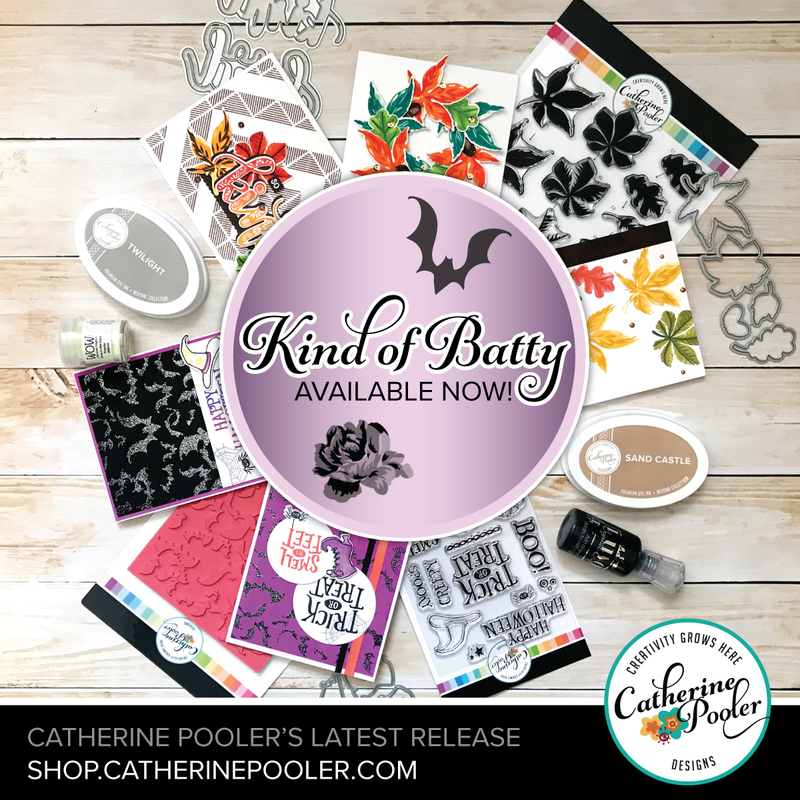 Products are NOW AVAILABLE for purchase in the Catherine Pooler store! I've have made so many cards with this first group of products that I'm showing today that it was hard to narrow down which ones to share! You'll be seeing a lot of cards using these products in the weeks to come! I've put together a few videos with tips on lining up the stamp images that I'm going to share with you today also. This first card is my favorite of all of the cards that I made with these products! It reminds me of a picnic, I think because of the colors. I first stamped the background with Sauna ink using the cool and very versatile Angled Squares Background Stamp. I die cut the tag from the Lovely Flowers & Banners die set to help make the focal point of the card. I stamped the large Kind in Rockin' Red ink from the Kind of Wonderful stamp set and then added "of wonderful" underneath from the same stamp set. The gorgeous flowers are from the new Rose Garden Stamp set & coordinating Rose Garden die set. Below is a video with tips on how to line the flower stamps up. The biggest tip that I found and that a Design Team member shared with me is to start by stamping the 3rd layer stamp first and then stamp the rest. That was a game changer for me! I demonstrate this tip in the video. The colors I stamped the flowers & leaves in are: All that Jazz, Juniper Mist, Sauna, Shea Butter, Rockin' Red, Peppermint Scrub, Garden Party, Lime Rickey, Eucalyptus, Spruce, Over Coffee & Icing on the Cake. I hope that that video helped to show how to line up the different layers. There is also a guide available on the stamp page that shows how to line them up as well. Like I mentioned before, the biggest thing to remember is to stamp the layers in this order: Layer 3, Layer 4, Layer 1, Layer 2 and die cut last. That helped me big time! I played around with the Angled Squares Background Stamp for this next card and found a fun way to layer the background! For the background on this card I stamped the Angled Squares Background Stamp three times in Mandarin Spice, Polished & Lime Rickey inks. I then used my paper trimmer to trim each piece down and then layered them on top of each other using dimensional tape. On the 2nd layer I also tied some twine around the panel to coordinate with the fall theme. Aren't those leaves gorgeous? I shared a video below on how to line each leaf up and I did it by die cutting the white cardstock first and then stamping the image on the die cut piece. I thought that this helped with easy placement (exactly opposite of how I did the Garden Roses stamp set on the first card.) The colors that I used for these leaves are: Tutti Frutti, Mandarin Spice, Sauna, Black Jack, Lime Rickey, Grass Skirt, Spruce, Polished, Coral Cabana, Rockin' Red, Shea Butter, Tiara, & Sauna. The sentiment, from the Kind of Wonderful stamp set, is stamped in the new Twilight ink. These leaves really are easy to line up! Hopefully you can see that by watching the video. I really enjoyed playing with this set a lot and have quite a few more cards to share in the next few weeks using them. Everything I've shared today is available to order now here. Leave a comment on my blog for your chance to win! We’ll randomly choose a winner from one design team member's post each day to win a $25 gift card to the Catherine Pooler shop! Winners will be announced on Monday, August 20th on Catherine's blog. Love the vibrant colors. So much goodness! Thank you Jen for those tutorials. It can be tricky to line up stamps and you made it look so easy. Love your color combos too. Thank you for sharing your layering technique tips! Lovely cards! the leaves go up in a line. The detail in the kindness stamp is absolutely gorgeous and unique. I love what you did with the background stamp. It is so cool and such a clever use of the stamp. What a fabulous release. Fantastic tutorials. Thank you so much for sharing that. Now I'm super excited to get my hands on that Autumn leaves stamp. Very pretty! Love that background stamp! Beautiful cards and I love the colors used. These are both very lovely. A great job on the backgrounds. Wow love the hint of summer in the colors. The stack d background using the complementary colors are great. These designs are making my art journaling and mixed media heart go pitter patter. Just in love with it all. The gold sparkle accents....yummy! These cards are so fun. 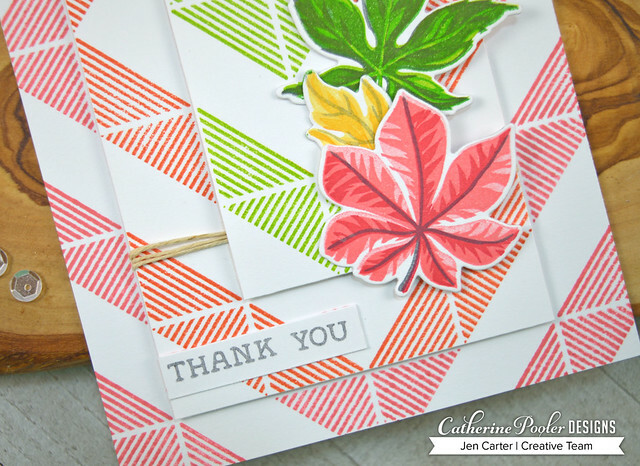 Thank you for sharing your layering stamp tips. Very helpful and inspiring. Wow! Those are amazing. Really love the dimension on the first one. What a fantastic use of the angled square background (which, by the way, is my favorite from this release!) I will be using this idea! Wow! Nicely done! I like your style very much! Thanks for sharing! I'm kinda loving those gorgeous floral clusters you created!!! Great job with the background stamp! Awesome! Love your use of the angled squares. Your color choices are fabulous so bright and cheerful. Your cards were very pretty. I especially enjoyed your videos - you did a nice job explaining everything. 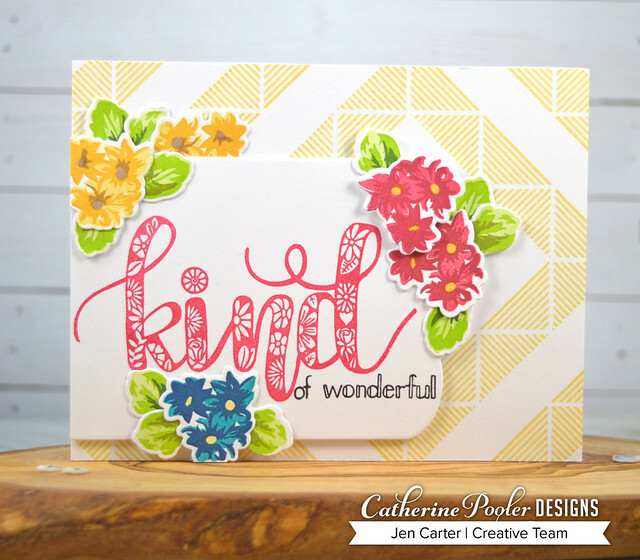 Love the way you layered the angle squared background stamp. Thanks for all the tips. Looks like there are many ways to do it, just a matter of finding what works best for you. I love how you used the Angled Squares background. I think this is my favorite from this release. Clever way to use the background stamp! Beautiful cards! Great technique and love the cards! It's so0 funny to me, I love this background! It is Awesome! I also love the smaller flowers you paired yours with! Thank You so much for sharing your projects! May God Bless You! Gorgeous cards! Love your color combos and details! Wonderfully sweet cards! I love the geometric backgrounds. 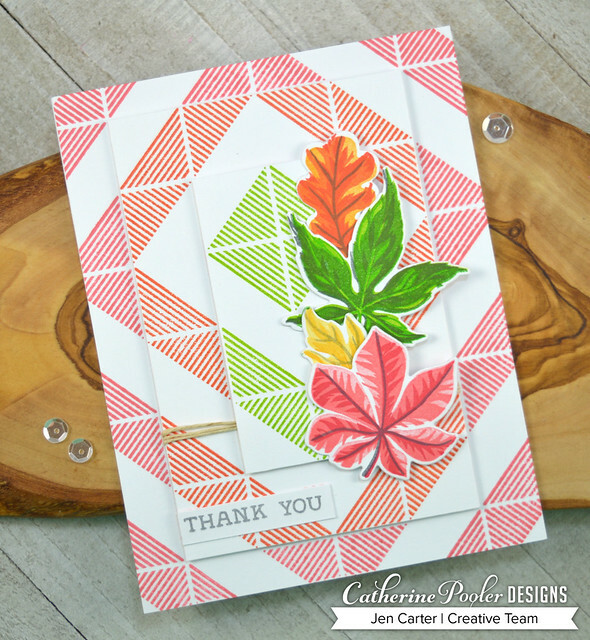 Great layering with the background stamp and love the leaves from the Autumn set.The kind card reminds of spring which is just around the corner for us down under in Australia. Truly amazing release! Wow. Jen, I really love your cards so gorgeous. Thank you for sharing your video's cause I learned so much from watching when it comes to layering and choosing the right colours. Love the cards and THANKS for doing the videos. Beautiful cards Jen and some great tips. I especially like the one about using the dots to start with for the little flowers - I'll have to try that. Cute cards!! I love how you layered the background in the second card. So clever!! I like the geometric on geometric design, unexpected. Love the cards. Great tutorial; so many useful tips. Thanks for sharing two very creative cards! These new stamps and colours are fabulous. Pretty card designs. I like the cheery colors. I love the layered stamps. OMG . . . the color. This card is so cheerful. I think it's that yellow background that is just amazing. Really love this. I just love the little flowers!!!!!!!! They are so sweet--and in different colors, too! Wow, these are so cute. I love the flowers!! !